It’s necessary to optimize the room’s acoustic characteristics according to definite terms in order to achieve high quality sound reproduction. This is achieved by forming “acoustically correct” geometry of the area, and also by using special acoustic treatment for inner surface of the walls and ceiling. It’s a common thing to deal with a non-changeable form room. In these cases, natural resonance of the room can extremely negatively affect the equipment’s sounding. Correct mutual position of acoustic systems, enclosing constructions and listening zone can be an important tool to help reduce room resonance and achieve realistic sound stage. Using the calculation results in practice will help to reduce room resonance influence, improve tonal balance and make sound stage more realistic. Calculations methodology is based on stereophonic principle of loudspeakers placing, recommendations on implementing “Golden ratio” principle by George Cardas, and general theory of psycho-acoustics. 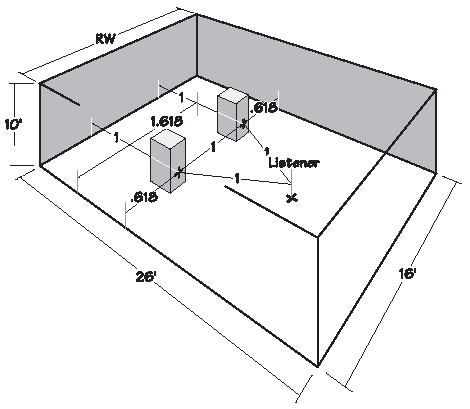 Find out more about this methodology from article "Placing loudspeakers in a rectangular room". Listener in the room perceives not only direct sound, emitted by acoustic systems, but its reflection off walls, ceiling and floor. Intense reflections off some inner parts of the room (areas of first reflections) interact with direct sound AC, which leads to changes in frequency characteristics, perceived by listener. 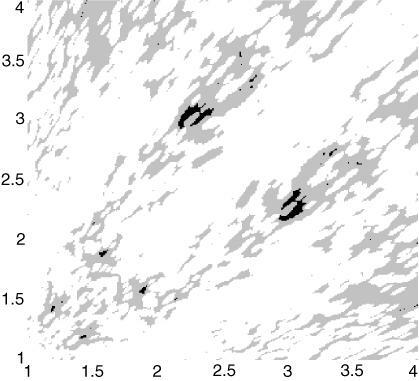 Sound escalates at some frequencies, and loosens at others. This acoustic defect is called “plicate filtration, and it leads to undesirable sound “coloration”. Manipulating the intensity of early reflections allows to improve sound stage quality and to make AC sounding more detailed and vivid. The most important are those early reflections off the areas, situated on sidewalls and the ceiling between the listening zone and AS. Furthermore, reflections off rear wall can affect sound quality if the listening zone is situated too close to the wall. It’s recommended to place sound-absorbing materials or sound-dispersing constructions (acoustic diffusers) at places with areas of first reflections. Acoustic treating must be suitable for frequency range, where acoustic distortions (plicate filtration effect) are observed the most often. Line sizes of applied acoustic coating should be 500-600 mm less than areas of first reflections. It’s recommended to agree the parameters of necessary acoustic treating with acoustic engineer in each definite case. Slot Helmholtz Resonator is a vibrating single-DOF system, so it has the ability to respond to one definite frequency, corresponding to its own frequency. Helmholtz Resonator’s distinctive feature is its ability to perform own low-frequency vibration, where wavelength is much bigger than the resonator’s size. This Helmholtz Resonator’s ability is used in architectural acoustics while creating so called slot resonator absorbers (Slot Resonator). In general, absorber’s construction is a timber framing erected on a wall or a ceiling surface. A set of slats with slots between them is put on the framing. Inner framing space is filled with sound-absorbing material. 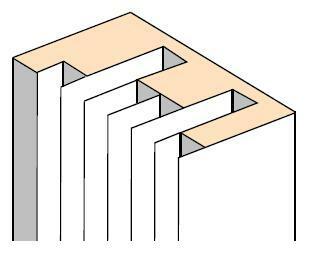 Resonant frequency of absorbing depends on slats cut, framing depth and insulation absorbing effectiveness. с - speed of sound in the air. If you use different width slats and adjust them to different slots, or use a frame with variable depth, it’s possible to build an effective absorber to work in wide range of frequencies. Helmholtz Resonator construction is simple enough and may be made from non-expensive and available materials in a music room or a studio while performing building works. 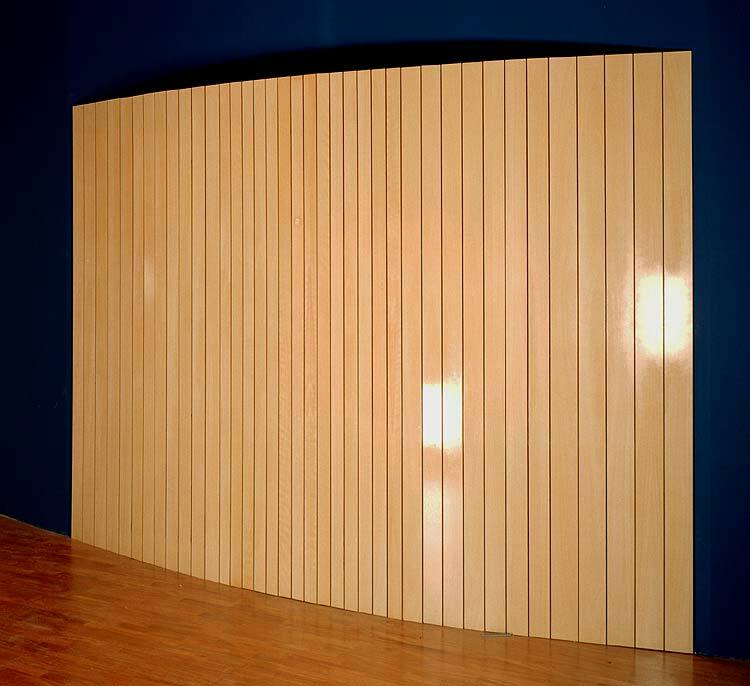 Panel conversion absorber is quite popular means of acoustic treating for critical listening rooms due to its simple construction and rather wide range of absorbing diapason in the area of low frequencies. Panel absorber is represented by hard resonator-framing with enclosed air volume, which is hermetically covered with flexible and massive panel (membrane). 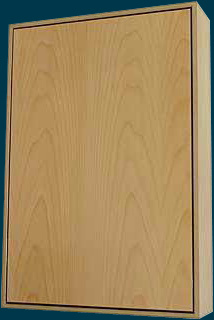 Plywood or MDF with glued inner layer of damping material are used as membrane material. Effective sound-absorbing material is put into the frame inner space. Sound vibrations motivate the membrane (panel) and the connected air. In this case kinetic energy o the membrane is converted into heat energy due to inner loss in membrane material, while kinetic energy of the air molecules is converted into heat energy due to viscous friction in sound-absorber. That is why we call this type of absorber conversional. Absorber is represented by a system mass-spring, due to which it has resonant frequency, which makes it work the most effective. Absorber can be tuned to desirable diapason often by changing its form, volume and the membrane’s parameters. Precise calculation of panel absorber resonant frequency is a complex mathematical problem, where the result depends on big quantity of initial parameters: fixation way of the membrane, framing construction, absorber’s characteristics, etc. Nonetheless, using some admissions and simplifications allows achieving acceptable practical result. Let’s consider that a membrane with surface density m is fixed on a framing with depth d and they vibrate as an integral unit with no surface deformation. Filling inner volume of the construction with sound-absorbing material reduces Q-value (Q) of the absorber, which leads to its working diapason extension. It’s possible to achieve bigger inner loss and enhanced absorbing effectiveness by putting thin, but massive layer of tough and flexible material. Theoretical working diapason of panel absorber is in +/- one octave relatively to calculated resonant frequency. It’s necessary to note that in most cases (simple home-cinema or studios treatment) the mentioned simplified approach is quite enough. But sometimes the solution of high-level acoustic problems requires more precise definition of panel absorber resonant characteristics, taking into consideration complex mechanism of the membrane flexural deformations. This requires holding/using more precise and rather lengthy acoustic calculations. This calculator helps to work out an acceptable proportion between studio line sizes, control rooms and music-rooms from point of view of reducing the impact of low-frequency resonances. It’s based on a methodology, created by Robert Walker in 1993, after a series of researches, held in Research Department Engineering Division of ВВС. As a result, a formula has been introduced to regulate the balance of room’s line sizes in quite wide limitations. where l – length, w – width, и h – height of the room. Besides, it should exclude integral balance of the room’s length and width with its height in bounds of +/- 5%. All sizes should correspond to the distances between the main enclosing constructions of the room. 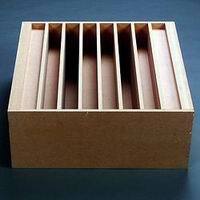 Schroeder diffusers, which construction is based on numbers theory, are an excellent tool for receiving diffuse sound field in different purpose rooms. Actually, Schroeder diffuser is a diffraction grid, which diffuses sound energy in wide range of frequencies, which falls to it, even at big size of falling angle. Schroeder diffuser consists of series of cells with different depth but equal width, made in a timber, MDF or other plate framing. Typical diffuser construction cut (p=7) is shown in the picture on the left. p –prime number (diffuser order), corresponding to the quantity of cells. Schroeder diffuser has the highest effectiveness of diffusing sound energy at the project frequency. Working frequency diapason depends on line sizes of the diffuser cells. The bottom of diffuser’s working diapason (flow) depends on the deepest cell size. The high bound of working diapason (fhigh) depends on cell width meaning. The diagram of sound energy dispersion at Schroeder one-dimensional diffuser is semi-cylinder. The influence of main resonances in a small-size room often leads to increase of reverberation time and frequency characteristics irregularities, which in its turn often leads to sound coloration. Problems may occur at low frequencies due to comparatively low mode density. Studio and music-room designers try to solve the problem by using rooms of relevant sizes, and also by situating listeners and loudspeakers in definite places. There have been introduced a lot of approaches to find optimal proportion in room sizes during recent decades. Mostly, these methods are aiming to avoid the cases where repeated modes are situated in narrow band. The major assumption states that if there’s music playing in a room, lack or boost of definite tone elements will reduce the sounding quality and affect tone structure. Usually, the starting point for these methods is defining modes in an enclosed rectangular room with solid walls. Richard Bolt (Richard H. Bolt, 1946) introduced a design chart, which allows defining preferred proportion of the room walls. Bolt was studying sound behavior in a camera, where enclosures in size were comparable with wave length. He introduced such group of proportions between height to length, and length to width, where modal frequencies were distributed sufficiently. Louden (M. M. Louden, 1971) calculated modes distribution for lots of proportions of room sizes and published list of preferable sizes, based on one control chart. Due to this method the well-known proportion 1:1,4:1,9 was received. Louden made researches over 125 combinations of room sizes balance with step 1,0. Robert Walker (Robert Walker, 1996) developed the criteria of room quality, based on calculating rms distance between mode frequencies. This method allows receiving range of practical and nearly optimal room sizes. In 1998 Walker’s formula was taken as a standard by European Broadcasting Union (EBU) and International Telecommunication Union (ITU). Trevor Cox recommendations (Trevor Cox, 2004) are based on working with a room with the most even mode frequency characteristics. Computer algorithm is used for multiple seeking for the best room sizes. Similar seeking is used while defining the best placement for sound source and sound detector. All the given methods, this way or another, have their own limitations. However, applying them in practice helps to identify the diapason of acceptable room proportions, avoid the worst cases and minimize the influence of room modes on tone balance and tone quality. where nx, ny and nz – are whole numbers, and Lx, Ly and Lz – are relatively length, width and height of the room. Для вычисления всех мод необходимо перебрать все возможные комбинации из трех целых чисел Nx, Ny, Nz. На практике же достаточно вычислить только низкочастотные моды, т.е. 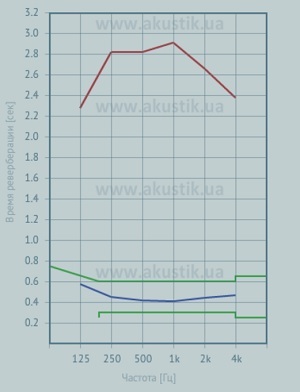 ограничиться максимальным N=4. It’s necessary to try all the possible combinations of three whole numbers Nx, Ny, Nz. in order to calculate all the modes. In practice, it’s enough to calculate only low-frequency modes, i.e. to confine to the maximal N=4. these modes are called axle or axial and, as a rule, are the most intense. Tangential modes emerge when sound wave is repeatedly reflected by the four surfaces, where pairs are parallel to each other. These modes can be calculated by combining two whole numbers and zero. For instance, array (1,1,0) allows to calculate a first-order mode in x-y (length-width) dimension. Such stationary modes emerge between the four walls of the room and are situated in parallel with the ceiling and the floor. Oblique modes emerge between all the six walls of the room. As mode energy accumulation takes place during each sound circle (a wave here locks itself after six re-reflections, losing part of its energy each time) oblique modes affect the sound less than any other stationary wave. It’s possible to calculate frequencies enhanced by these modes if you combine the set of three (1, 1, 1 – oblique mode of first order). Axial modes are, as a rule, the most intense and you can ignore the influence of tangential and oblique modes while giving rough estimates for room resonances distribution. Colorations largely determine the quality of sound for a small studio or listening room. The big task then is to determine which, if any, of the hundreds of modal frequencies in a room are likely to create colorations. due to overlapping skirts but will tend to act independently. In this isolated state it can respond to a component of the signal near its own frequency and give this component its proportional resonant boost. Zero spacings between modal frequencies are also a source of coloration. Zero spacing means that two modal frequencies are coincident (so called "degenerate" modes), and such degeneracies tend to overemphasize signal components at that frequency. 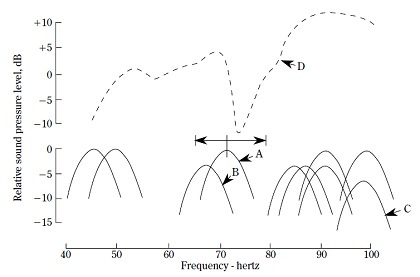 Presence of the isolated modes is the cause of dips in the amplitude-frequency response curve, whereas zero spacings between modal frequencies lead to peaks in the curve. High irregularity of amplitude-frequency response below 300 Hz causes unwanted acoustical defects, such as "boxy" or "boomy" sound. This acoustic calculator allows to calculate the near field length and determine the characteristic bands within the sound range bounded by F1-F5 frequencies. Sound pressure region. No resonant support for sound in the room. Room resonances region. Wave acoustics principles apply. The region is bounded above by Schroeder's frequency. acoustics. Diffraction and diffusion of sound waves. Reflection of sound waves region. Geometric acoustics principles apply. This calculator is only applicable for evaluation of problematic modal frequencies in rooms of simple rectangular shape with little absorption. Reverberation time (T, s), a concept introduced by W.C. Sabine at the end of 19th century, remains one of the most important acoustic properties of the room. Standard reverberation time is defined as that time required for the sound-pressure level in a room to decay 60 dB after a source stops generating sound. It characterizes degree of boominess of the room. In general, shortening of reverberation time leads to better clarity and speech articulation, i.e. increases the degree of acoustic comfort. Shortening of reverberation time is achieved by using sound absorbing materials on the walls, floor, and ceiling. This acoustic calculator designed to estimate reverberation time of the room depending on its purpose, and to preselect required quantity of sound absorbing materials. Besides using internal database of sound absorbing materials, the program allows to enter sound absorption coefficients of any arbitrary materials taken from reference books.